Please tell us if you will be picking up in Toronto or if you want your order shipped. If the actual cost will be greater than the total shipping you have paid I will contact you for approval. Please note examples of actual costs below. When you buy a water purifier in 2019 and donate any amount to the Water Protectors of Unist'ot'en Camp​, we will match your donation up to $100! NOTE: Our nearest competitor charges 2-3 times more in US Dollars for filters, taps and floats! Our prices are still the lowest in North America! Terra Cotta Water Purifying Crocks from Brazil! Terracotta crocks are complete with filters, tap, and float valves. The filters need to be replaced every 6 months, and the tap and floats will last many years. ~ 4L $175 + Shipping. Best for drinking water for one person. The height of the 4L is 18" including the cap top. It measures @9" around. São João Style (see lower right photo). ~ 6L $200 + Shipping Best for 2 people for drinking water, or 1 person who also cooks with purified water. The height of the 6L is 21" including the cap top. It measures @10" around. Classic Style (see the lower left photo). ~ 8L $225 + Shipping Best for household or 2 people who make soups soak beans etc. The height of the 8L is 24" including the cap top. It measures @11" around. Classic Style (see the lower left photo). ~ 10L $250 + Shipping Best for household OF 3+ people who make soups, soak beans etc. 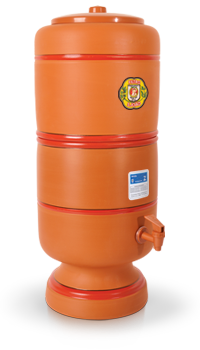 The height of the 10L is 25" including the cap top. It measures @11" around. São João Style (see lower right photo). ~ 13L $400 + Shipping Best for a larger household, spa, clinic or cosmetic maker. The height of the 16L is 30" including the cap top. It measures @12" around. São João Style (see lower right photo). STEFANI HAS STOPPED MAKING THE 16L WATER PURIFIER. SHIPPING & HANDLING: Packing, handling, shipping and insurance within the continental US & Canada normally costs $100 - $200. I will bill or refund you any differences greater than 10% of what you paid. Please choose the Shipping & Handling Supplement ($200) also unless you are picking up in Toronto. 8L water purifier Toronto to California $208.72. 10L water purifier Toronto to Vancouver $152.55. 10L water purifier Toronto to Honolulu HI $409. 16L water purifier Toronto to Scandinavia $922.08. INSURANCE: Shipped and pick up water purifiers are unpacked and inspected for damage before sending. We always replace any items that break during shipping at our own expense. If you find any items broken upon unpacking, please photograph. Your honesty is appreciated. What is a Stefani water purification crock? ~ It is a two-piece, sturdy terra cotta countertop unit that uses gravity to purify water. ~ It's handmade in Brazil by local artisan potters by a family social enterprise. ~ It uses triple action micro-pore ceramic, colloidal silver and activated carbon filter cartridges to make delicious water totally safe for consumption. ~ It is assembled and disassembled without tools and only the float is a moving part. Why use a Stefani water purification crock? ~ It's healthy. The triple action micro-pore ceramic, colloidal silver and activated carbon filter cartridges efficiently reduce and remove chlorine, bacteria, lead, viruses, fungus and other harmful microorganisms and chemicals. Because the filters are ceramic, not plastic, they do not leach hormone-disrupting chemicals into your water and into the landfill afterwards. ~ It's environmentally friendly Using the Stefani crock eliminates single-use plastic water bottles, comes in a cardboard box and replaces many plastic water filter cartridges. It also uses no electricity because the water is gravity fed, and does not waste water (unlike reverse osmosis which concentrates toxins in the 70% of the water it wastes). ~ It's affordable. Ceramic and stainless steel water crocks generally cost 4 times more to buy, and water purifying machines cost 7 times more to buy. Conventional countertop and refrigerator pitchers cost 2 to 4 times more to operate because of the need to change the filters more often. Stefani Traditional triple action filters make water crystal clear and eliminate impurities present in the water. Each sterilizing and dechlorinating filter candle contains colloidal silver and activated carbon elements that efficiently reduce and remove chlorine, bacteria, lead, viruses, fungus and other harmful microorganisms and chemicals making water totally safe for consumption. 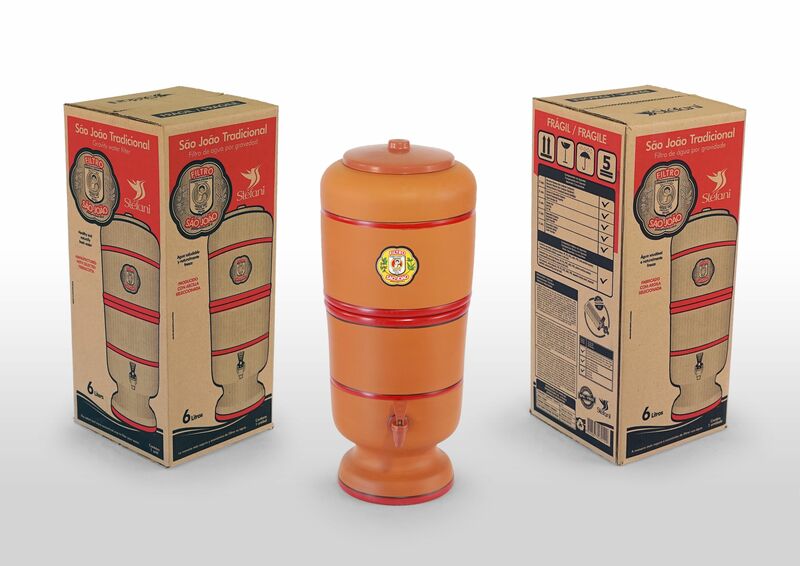 The replaceable Stefani Traditional triple action filters last up to 6 months or 500 litres of water filtered. 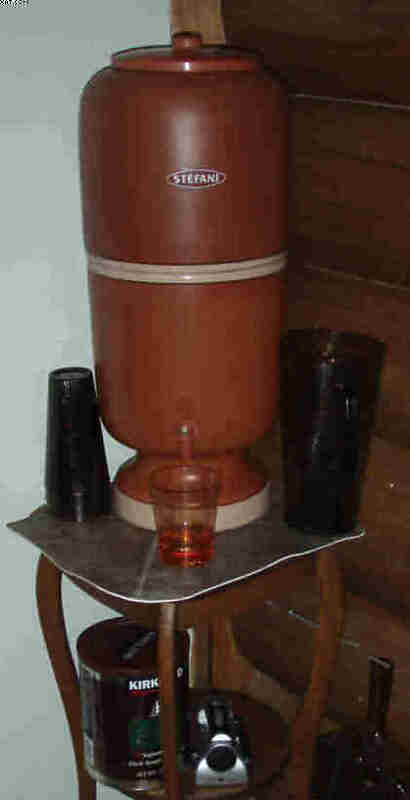 Conventional water filtering jugs offer replacement filters that last only up to 6 weeks and are normally made of hormone-disrupting plastic. The ceramic wall on the replacement filters offers superior filtration of 0.5 microns which is like a fraction of a particle of sand. This removes most impurities from your water not offered by popular solutions. Stefani water purification crocks require no electrical power and eliminate the use of plastic water bottles in homes and cottages and thereby reducing environmentally hazardous waste! Used worldwide for its excellence in design and water purifying qualities in countries like US, England, Australia, South Africa, Peru and others. Respected and used extensively by Non Governmental aid Organizations as an affordable solution to provide clean water to underprivileged areas of the world. ~ cosmetic makers who want to replace distilled water with pure filtered water. Nothing can provide more pure water than the Stefani water purification crock. It works as a real water treatment plant. The revolutionary Stefani Traditional triple action filter, with colloidal silver and activated charcoal, filters the impurities, eliminating bacterias and microorganisms, reduces odours, flavours and the quantity of chlorine in the water. Stefani Traditional triple action filters (with Micropore Ceramics, Activated Carbon and Colloidal Silver) have triple action and purify water in four stages. ~ Triple Safe Filtration System. ~ Materials- the outer layer is made of ceramic porcelain. The interior of the filter contains granular activated carbon ATC media. ~ Performance factors- the filter removes chlorine, herbicides, pesticides, heavy metals including lead, aluminum, iron, giardia, cryptosporidium, e-Coli and sediment. ~ Water sources: tap, well, river, lake, a stream can be used. Not for use with salt water. ... Resulting in naturally fresh and a 100% healthy water. I am presently the only supplier of Stefani water crocks, filters, and replacements parts: float valves and taps in North America!!! I carry a small stock because I am committed to my two water crocks for the production of natural cosmetics and for my family, and to my clients who have purchased water crocks from me. FILTRES ARE ALWAYS IN STOCK! Replace filters every 6 months or 500 litres, whichever comes first. If your water is filtering very slowly before that time, that's good news - your cartridge has trapped a lot of metals and larger particles because your water is hard or dirty. Simply remove the filter cartridges and scrub with a non-metallic scrubber in plain running water. Your cartridge has trapped a lot of metals and larger particles, but your filtered water will be purified! Above you can see the inner charcoal centre. WHERE TO PUT IT: These beautiful terra cotta water crocks are best on a stand where household members can easily get a glass of water or refill a bottle. A stand provides the best ventilation around the crock, too, and puts water at the centre of household life! In hot countries, water crocks are placed just outside the front door! The hotter the air, the cooler the water thanks to evaporative cooling. Sharing this water with passersby is often traditional. If you are putting the crock under cupboards on a countertop, please give yourself clearance so that you can fill the purifying reservoir with water. In a tight spot, a watering can be easiest. Please note that limiting air circulation around the water purifier may result in mould growth on the outside of your purifier. Please strive to keep the water purifier on a countertop, stand or otherwise in the open. Water crocks come with all parts and filters needed. Most clients order a set of filters so that they are set for a whole year. Taps and floats do not need replacement unless accidentally broken. It's nicer to clean them once in a while, though! REPLACEMENT Any part which is found to be defective after we've gone over troubleshooting by phone or email will be replaced. RETURNS will only be accepted for unopened saleable items. Efflorescence and other maintenance issues, breakage once you have taken possession, or from any forceful installation will never be a reason for return. To reserve one, please order and prepay below. Upon pick up, you can see each size put together and change your order if you like and pay or be refunded any difference. Local delivery in the City of Toronto, delivery by bike courier may be available for an extra $20 with a few days notice. Please request in the Comments with your order. Please LIKE the Facebook page https://www.facebook.com/StefaniWaterPurifiersCanada/, leave a comment/review, then ask me how to receive 20% off!